A major new report produced on behalf of Middle East Electricity (MEE), the region’s leading annual international trade event for the power industry, has projected $1.68 billion worth of growth in the GCC’s smart grid market over the next eight years. The growth will come from increased deployment of smart grid infrastructure by GCC governments, according to the ‘GCC Power Market’ report produced for Middle East Electricity by Ventures Onsite. The report forecasts major opportunities for smart grid technology providers as the UAE leads regional moves to integrate renewable energy sources and projects into domestic grids. “The UAE’s vision to deploy smart grid and metre solutions is expected to increase the renewables contribution, which is in line with the UAE’s Energy Plan 2050,” says the report. The smart grid market is also expected to receive a major boost from GCC-wide plans for smart cities. 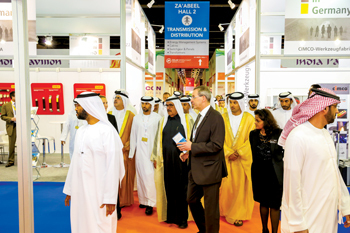 “Dubai is already being held up as a smart grid pioneer, particularly since its investment in Shams Dubai, the emirate’s first smart initiative to connect solar energy to buildings as part of its Distributed Renewable Resources Generation programme,” explained Anita Mathews, Group Director – Industrial Portfolio at Informa Exhibitions, which organises the event. “Another major market boost will come from Saudi Arabia’s plans for the Neom mega city, the first phase of which is due in 2025 and which is set to become a test case for a zero-energy mega-city,” she added. With smart grid commitments in the Gulf driving regional energy industry interest, the scale of exhibitor commitments for Middle East Electricity, running at Dubai World Trade Centre from March 6 to 8, is also up. “There’s been a tangible increase in the speed of sign-up which has resulted in over 1,500 exhibitors from 66 countries and 24 dedicated country pavilions in the exhibitor profile for 2018. Middle East Electricity has long been a bell-wether for the regional industry and participation this year reflects how government policy planners are prioritising energy sector innovation, specifically in terms of cost efficiency and how it is now driving industry operators and their supply networks,” she said. Smart grids will also be in the spotlight at the Global Smart Energy Summit (GSES), which will debut alongside Middle East Electricity 2018. The Summit will hear from Dutch energy distribution veteran, Marko Kruithof, on how to optimise smart grids to reduce peak load and operating costs, and defer new power grid investment. “As a senior manager in sustainability and renewal at Dutch energy grid operator Stedin and the current chair of the Dutch Power Foundation, Marko is one of the global industry’s most respected players,” said Ryan O’Donnell, GSES’s Programme Director. “Delegates have the opportunity to learn from the experience of a country which, thanks to its progressive policies, affinity for innovation and forward-thinking and environmentally-conscious population, has become a leader in offshore, renewable and smart energy. With major power advancements on the cards throughout the region, Informa has expanded Middle East Electricity’s profile to cater to shifting sector dynamics. The 2018 show will debut a dedicated Energy Storage & Management Solutions segment alongside its four other specialised show sectors: Transmission & Distribution, Power Generation and Lighting stalwarts, as well as Solar, which becomes a dedicated sector after six years as a co-located event. Middle East Electricity is held under the patronage of HH Sheikh Maktoum Bin Mohammed Bin Rashid Al Maktoum, Dubai Deputy Ruler, and is hosted by the UAE Ministry of Energy.